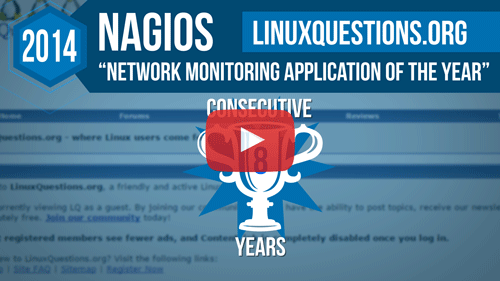 We are proud to announce that Nagios has been awarded Network Monitoring Application of the Year in the 2014 LinuxQuestions.org Members Choice Awards! This marks the eighth consecutive year of winning this award. Thank you to everyone who voted, we appreciate your support! Click here to view a list of all 2014 LinuxQuestions.org Members Choice Award winners.